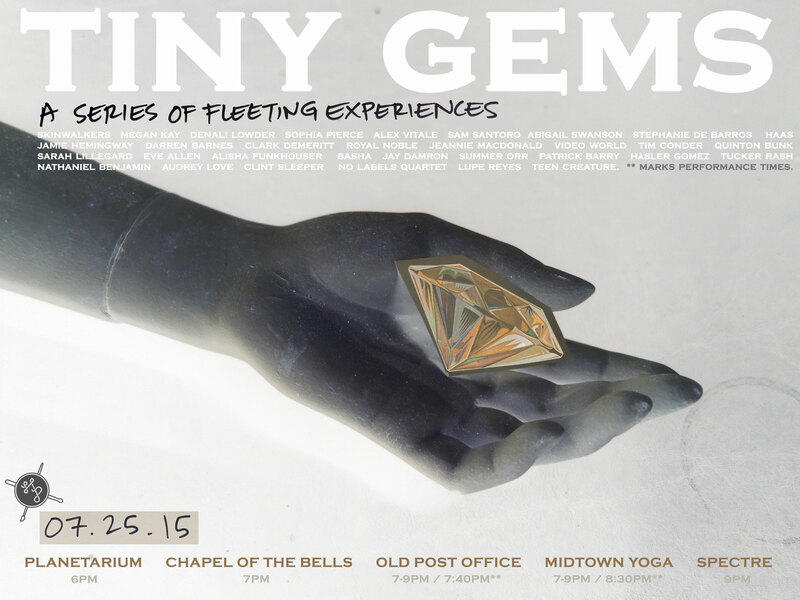 Join us on Saturday, July 25 for Tiny Gems: a series of pop-up installations and performances in non-traditional locations. Five special locations city-wide – the Planetarium, Chapel of the Bells Wedding Chapel, the basement of the Old Post Office, Midtown Yoga, and Spectre Records – will all host short, intimate, unique, and fleeting experiences. Choose your own adventure or make them all – time suggestions below. -Assembly Line feat. Darren Barnes, Jamie Hemingway, Clark Demeritt and Julian Jacobs. -Installations from Sarah Lillegard, Tim Conder, Alisha Funkhouser + Patrick Barry, Jay Damron, Summer Orr, Nathaniel Benjamin, Tucker Rash, Häsler Gomez, Lupe Reyes, and more. -Site Specific Performances from Quinton Bunk + Eve Allen, Basha, and No Labels Quartet. **this event is made possible in part due to generous funding from the City of Reno Arts and Culture Commission.